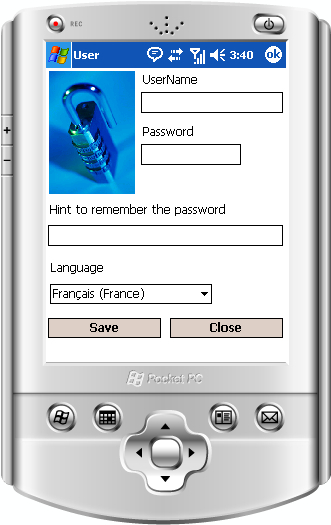 "Secure Password Wallet for PocketPC/Smartphone" is a great tool which will save you time and frustration. With "Secure Password Wallet for PocketPC/Smartphone", don't be afraid of loosing your password or private and confidential information. "Secure Password Wallet for PocketPC/Smartphone" keeps your data and allows you to retreive them at any time you need them. Why always using the same password from here and there? Just because you may forgot about it! That's it, Now! with "Secure Password Wallet for PocketPC/Smartphone" keep changing them anytime and save them in your Secure Wallet, so the next time you forget about just search for it in your "Secure Password Wallet for PocketPC/Smartphone".